Joris-Karl Huysmans, photographed by Dornac. Charles-Marie-Georges Huysmans (February 5, 1848 – May 12, 1907) was a French novelist who published his works as Joris-Karl Huysmans; he is most famous for the novel À rebours. His style is remarkable for its idiosyncratic use of the French language, wide-ranging vocabulary, wealth of detailed and sensuous description, and biting, satirical wit. He began his career in the school of Naturalism, but later broke with the naturalists. His novels are also noteworthy for their encyclopaedic documentation, ranging from the catalogue of decadent Latin authors in À rebours to the discussion of the symbolism of Christian architecture in La Cathédrale. Huysmans' work increasingly expressed disgust with modern life and a deep pessimism, which led the author first to the philosophy of Arthur Schopenhauer but later to the teachings of the Catholic Church. Huysmans was born in Paris to a Dutch father, Godfried Huysmans, who was a lithographer by trade. His mother, Malvina Badin, had been a schoolmistress. 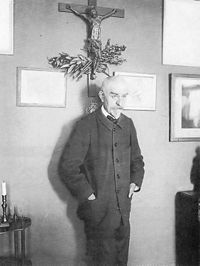 He published his works as "Joris-Karl Huysmans," using an approximation of the Dutch equivalent of his forenames, to emphasize his roots. Huysmans' father died when he was eight years old, and his mother quickly remarried, leaving Huysmans feeling a great deal of resentment against his stepfather, Jules Og, a Protestant who was part owner of a Parisian book-bindery. Huysmans' school years were unhappy but he obtained a baccalauréat. For thirty-two years, he worked as a civil servant for the French Ministry of the Interior, a job he found insufferably tedious. The young Huysmans was called up to fight in the Franco-Prussian War, but was invalided out with dysentery, an experience he described in his early story Sac au dos (Backpack) (later included in Les Soirées de Médan). His first major publication was a collection of prose poems, heavily influenced by Baudelaire, called Le drageoir à épices (1874). They attracted little attention but already revealed flashes of the author's distinctive style. Huysmans followed it with Marthe, Histoire d'une fille (1876). The story of a young prostitute, it was much closer to Naturalism and brought him to the attention of Emile Zola. His next works were in a similar vein: somber, realistic and filled with minutely detailed evocations of Paris, the city Huysmans knew intimately. Les Soeurs Vatard deals with the lives of women in a bookbindery. En Ménage is an account of a writer's failed marriage (Huysmans himself never married, but had a long-term mistress called Anna Meunier). The climax of this early period is the novella À vau-l'eau (Downstream or With the Flow), the story of a downtrodden clerk, Monsieur Folantin, and his heroic and futile quest for a decent meal. This was followed by Huysmans' most famous novel À rebours (Against the Grain or Against Nature) (1884), which featured a single character, the aesthete des Esseintes, and decisively broke from Naturalism, becoming the ultimate example of "decadent" literature. À rebours gained further notoriety as an exhibit during the trials of Oscar Wilde in 1895, during which the prosecutor referred to the novel as a "sodomitical" book. The book also appalled Zola, who felt it had dealt a "terrible blow" to Naturalism. Huysmans began to drift away from the Naturalists and found new friends among the Symbolist and Catholic writers whose work he had praised in À rebours, including Jules Barbey d'Aurevilly, Villiers de L'Isle Adam, and Léon Bloy. Stéphane Mallarmé was so pleased with the publicity his verse had received from the novel that he dedicated one of his most famous (and most obscure) poems, Prose pour des Esseintes to its hero. Huysmans' next novel, En rade, a highly unromantic account of a summer spent in the country, was relatively unsuccessful commercially. In 1891, the publication of Là-Bas (Down There) attracted considerable attention for its depiction of Satanism in late 1880s France. The book introduced the character Durtal, a thinly disguised portrait of the author. The later Durtal novels, En Route (1895), La Cathédrale (1898) and L'Oblat (1903), trace Durtal/Huysmans' conversion to Roman Catholicism. En Route depicts Durtal's spiritual struggle during his stay at a Trappist monastery. La Cathédrale finds the protagonist at Chartres, making an intense study of the cathedral and its symbolism. In L'Oblat, Durtal becomes a Benedictine oblate, finally reaching an acceptance of the suffering in the world. Huysmans was also known for his art criticism: L'Art moderne (1883) and Certains (1889). He was an early advocate of Impressionism, as well as an admirer of such artists as Gustave Moreau and Odilon Redon. He was a founding member of the Académie Goncourt. Huysmans was made a Chevalier de la Légion d'honneur in 1892, but only for his work with the civil service. In 1905, his admirers persuaded the French government to promote him to officier de la Légion d'honneur in view of his literary achievements. In the same year, Huysmans was diagnosed with cancer of the mouth. Joris-Karl Huysmans was interred in the Cimetière du Montparnasse, Paris. Against The Grain by Joris-Karl Huysmans Project Gutenberg ebook (Also known as Á Rebours or Against Nature). Là-bas (Down There) by J. K. Huysmans Project Gutenberg ebook (Also known as The Damned). The Cathedral by J. K. Huysmans Project Gutenberg ebook. This page was last modified on 5 June 2018, at 23:12.